Air conditioning is an invaluable piece of technology, especially here in Las Vegas. Without it, sweltering temperatures and sweaty t-shirts would be inescapable. It may surprise you, but we actually have to go pretty far back to find a time without some form of air conditioning. Today, we’re going to take a look at the history of this device that is now an essential piece of everyday life for many households. This will be the first part of a series detailing its history and the effect it had on America at the turn of the century. If your air conditioner is letting you down, call Tippetts Mechanical today! Our HVAC gurus have the know-how and determination to get your AC back in fighting shape. In the 1840s, as the Oregon Trail was being explored and Samuel Morse was first writing his code, there was a physician and inventor by the name of Dr. John Gorrie. Dr. Gorrie, feeling the oppressive heat of Florida, posited the idea of cooling cities as a way to protect people from what he called “the evils of high temperatures.” His theory was that diseases like malaria were being spurred on by the heat and they could combat that with cooler temperatures. It was also an attempt to make his patients more comfortable, but his initial system was too basic to truly have the full desired effect. Add in that this process required ice from frozen northern lakes and streams had to be shipped down to Florida, and you can see why this wasn’t a sustainable model. Dr. Gorrie knew this was a shortcoming he’d have to work around, so he started working out a concept for artificial cooling. His first step in these experiments was a machine that could create ice using a compressor powered by either horse, water, wind power using sails, or steam. He finally received the patent for this invention in 1851, though he was unable to bring it to the market due to the death of his primary investor. Though he wasn’t able to see it to fruition, the foundation had been set for the future of air conditioning and refrigeration. After many years of stagnation, the artificial cooling ‘baton’ was picked up by Willis Carrier, an engineer working at the Buffalo Forge Company tasked with finding a solution for a humidity issue that caused magazine pages to wrinkle at Sackett-Wilhelms Lithographing and Publishing Company in Brooklyn, NY. Carrier began experimenting with a system that could control humidity by using cooling coils, which he then patented as his “Apparatus for Treating Air” in 1902. This apparatus could humidify the air by heating water, or dehumidify the air by cooling water. Though it took 51 years from Dr. Gorrie’s original patent, the air conditioner was well on its way to being a reality. Carrier didn’t stop there though. He continued to experiment, test, and refine his technology until he landed on his next invention he’d patent, an automatic control system designed for regulating humidity and air temperature in textile mills. He quickly realized that humidity control and air conditioning had a wide range of industries they could benefit. It was with that realization that he left Buffalo Forge and formed his own company, Carrier Engineering Corporation, along with six other engineers. Shortly after the patent of the “Apparatus for Treating Air”, the World’s Fair was held in St. Louis in 1904. It was there that organizers employed mechanical refrigeration to cool the Missouri State Building, which was one of the centerpieces of the World’s Fair. In order to cool the 1,000 seat auditorium, rotunda, and many other rooms, the cooling system used 35,000 cubic feet of air per minute! This was the first time the American public had experienced air conditioning of any form, and it’s safe to say it was a hit with the crowd. Sadly, the cooling system was unable to prevent a fire caused by an exploding boiler two weeks before the World’s Fair was set to end, destroying almost all of the Missouri State Building. Nearly 20 years later, the air conditioner got its big break alongside the budding movie stars of the day, as it became a massive selling point for movie theaters to bring in customers wanting a break from hot summer days. Those early theater cooling systems were really heating systems that had been modified with refrigeration equipment, which distributed cold air through floor vents. Unfortunately, because this was not the original design or intended use, it didn’t quite work as well as they hoped, but it was a start. The issue that arose was incredibly cold temperatures in lower areas of the theater, while the upper levels became swelteringly hot and muggy. Some theatergoers even had to wrap their feet up with old newspapers to stay warm. That’s how cold it got! In 1922, Carrier Engineering Corporation installed the first fully functioning, well-designed cooling system at the Metropolitan Theater in Los Angeles. This system actually tackled humidity control by pumping cool air through higher vents, which also provided better comfort for the building as a whole. A few months later, in May 1922, New York’s Rivoli Theater debuted a first of its kind cooling system that used a centrifugal chiller. This was a breakthrough because it used far fewer moving parts and compressor stages than previous units did. This made the system more reliable and lowered the cost, which made them a much more attractive prospect to other theaters and businesses around the country. As we’ve just only touched on the 20th century, you can bet there’s much more amazing history left to cover. 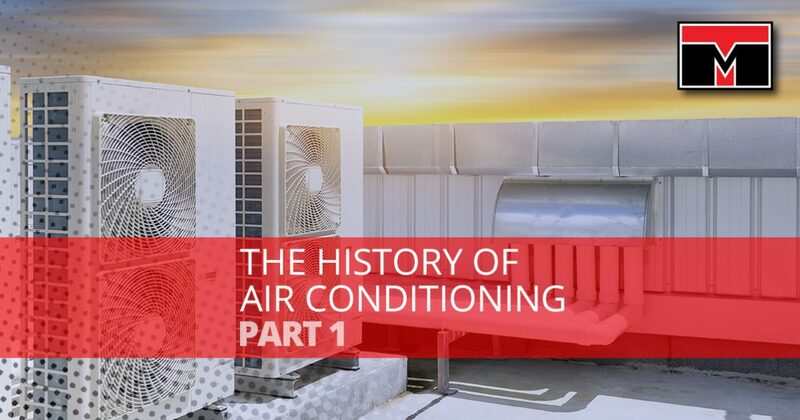 We’ll be continuing this look at the history of air conditioning in the coming weeks, so we hope you’ll come back and join us on this journey. If you are in need of air conditioning service, repair, or cleaning, call Tippetts Mechanical. With years of experience, we are the HVAC gurus of Las Vegas. It’s cool to be cool, and we want to help.